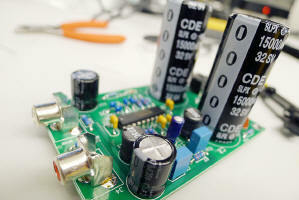 In the winter of 2011/2012, a one day workshop was conducted in school in conjuction with Bose. 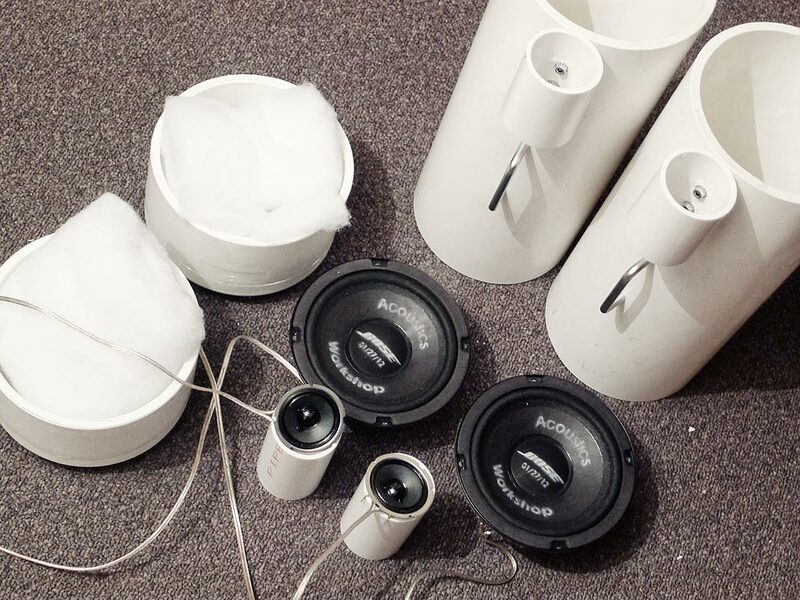 The workshop was simple - design and build a speaker system in a day. This page briefly documents the construction of this set of loudspeakers. Speakers need to be driven by amplifers. 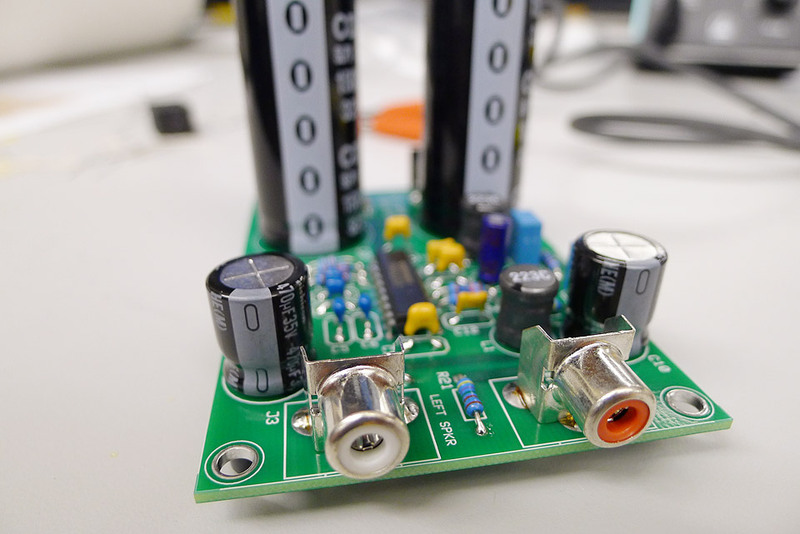 A simple amplifer kit was used for this project, based around the TPA3122D2N - a 15-W Stereo Class-D Audio Power Amplifier by Texas Instruments. According to TI's official website for the product, the "TPA3122D2 can drive stereo speakers as low as 4 Ohms. The efficiency of the TPA3122D2 eliminates the need for an external heat sink when playing music...". The amplifer is powered by an external 18.5V 3.5A power supply unit. Note the two RCA jacks outputting the driving signal to the speakers. 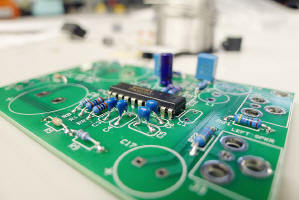 While unconventional (since RCA is usually used to transmit signal instead of actual driving current), their simplicity, low-cost and ease of use make them ideal connectors to the speakers. 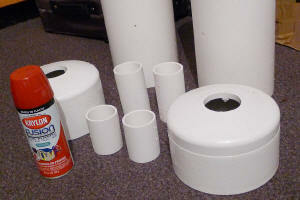 The main body of the speakers are constructed from 6" Sch 40 PVC pipe. This houses the main 6" Woofer transducers, with a smaller pipe for the tweeter. The pipes were cleaned and sanded for spray-painting. Note the port cut into the two 6" end-caps. The bass ports and the size of the tubes were deliberately chosen to match the volume, and thus acoustic characteristics of the Bose 201 speaker system. Crossovers were made using a simple resistor-capacitor setup. The resistors are 2.7 Ohm (5W), and the capacitors 4.7uF 50V non-polarized electrolytics. 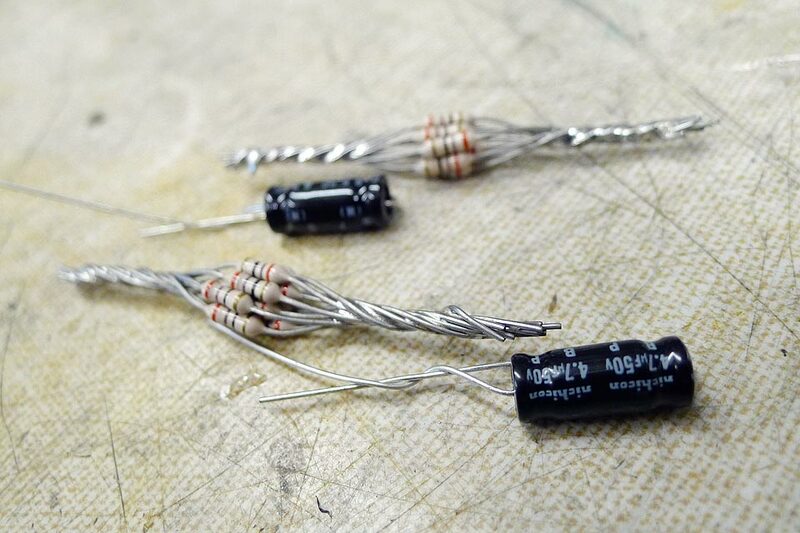 This acts as a simple high-pass filter for the tweeters. Everything was connected using 18 AWG speaker cable. 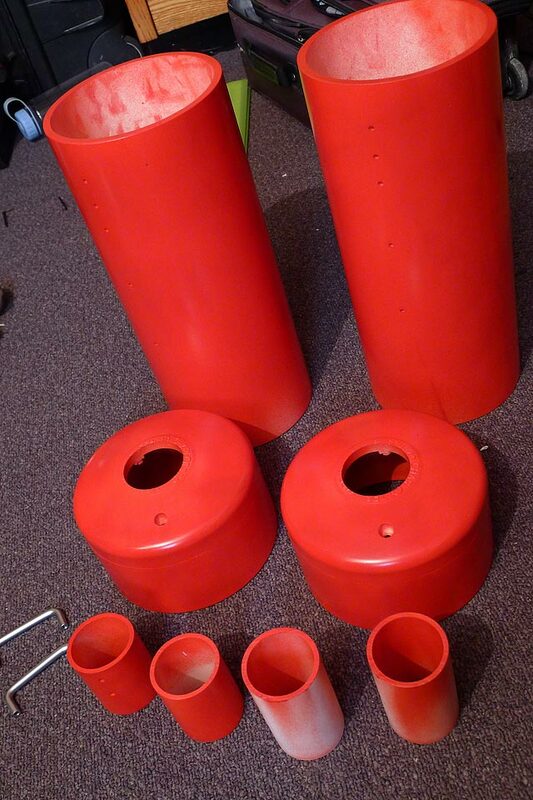 The bass-port tubes were hot-glued into the place after all the components were spray-painted (what else but a lovely red - it really red in real life, not the orange it might appear on your screen). 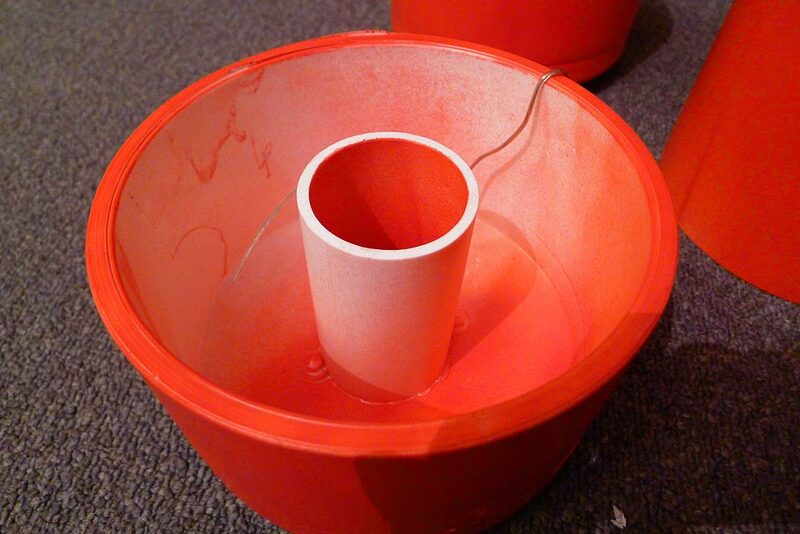 Unfortunately, the cylindrical design has a tendency to set up standing waves at certain frequencies. 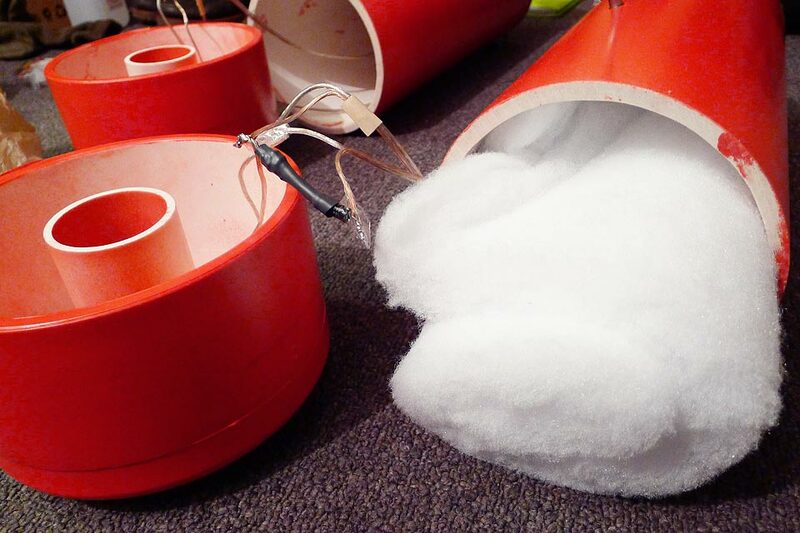 Hence a lot of fluff was stuffed inside the main bass volumes to attenuate any standing waves which may form. All connections were soldered together; a handle was installed, and the end-caps closed. Above - the completed set of speakers. Note the two stainless steel handles at the top of each speaker. The RCA cable plugs in from the rear. 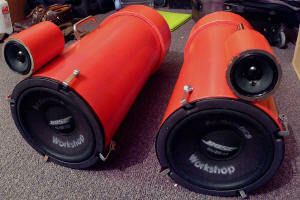 The 6" Bose woofers are screwed to the main tube by 4 picture-frame hangers and #4 wood-screws. In order to ensure a good seal, foam-tape was applied between the 6" transducers and the main chamber tube. Everything else is held together using 8-32 bolts and locking nuts. The speakers perform admirably even with the small 15W amplifer. They have no problem handling up to 100W (though beefy RCA cables will have to be used). Loneoceans Laboratories. Copyright (c) 2003 - 2012 Gao Guangyan, All Rights Reserved. Design 3.